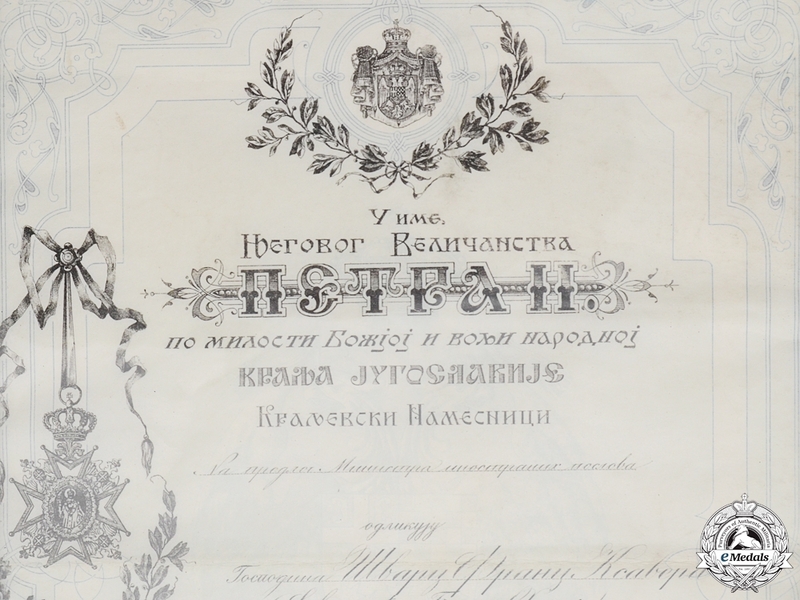 An Award Document for Royal Yugoslav Order of St. Sava, First Class, printed on velum (parchment made from calf skin, used for important documents only), multicolored, with embossed seal at the bottom, measures approx. 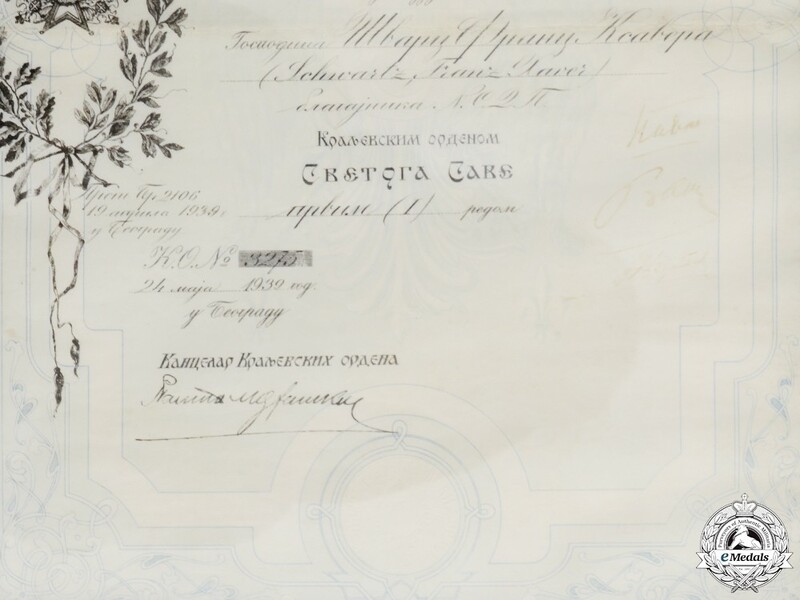 28cm x 40cm (or 11 x 16 inches); signed by Prince Paul of Yugoslavia (Prince Regent of Yugoslavia); No 3275, and dated 24 May 1939; named to (in Cyrillic and Latin script) "Gentleman Franz Xaver Schwarz, Treasurer of NSDAP); (treasurer and NSDAP in Cyrillic script only). Folded, in excellent condition. 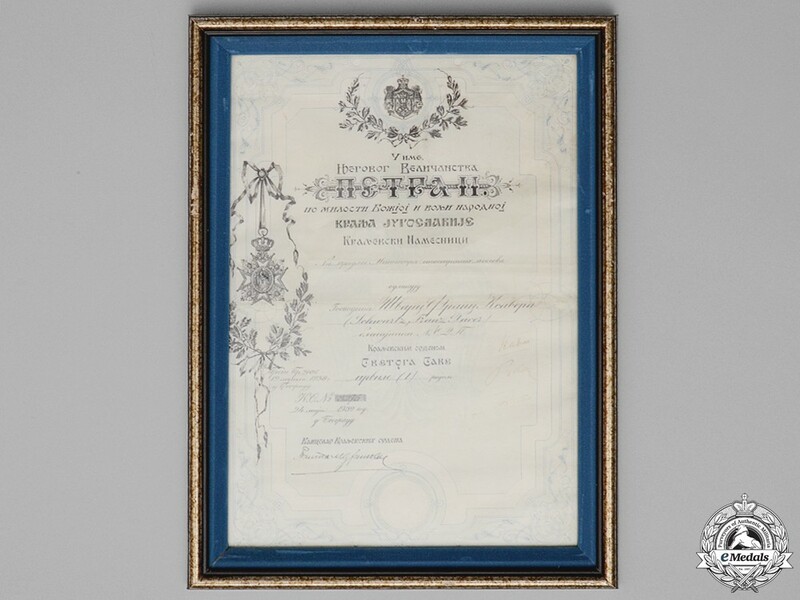 Footnote: Prince Paul of Yugoslavia went to an Official State visit with Hitler in June 1, 1939, with intent to secure peace between Yugoslavia and Germany (this agreement was reached eventually in March 25, 1941). 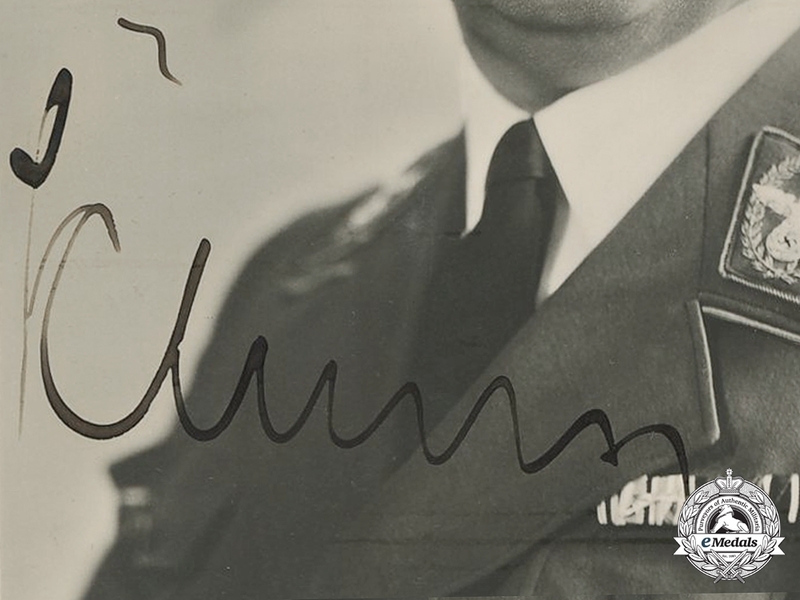 Before the visit in 1939, according to Colonel Vauhnik (a member of the military attache in Berlin), Himmler insisted to be awarded the Order of Yugoslav Crown 1st Class - which he received during this visit). 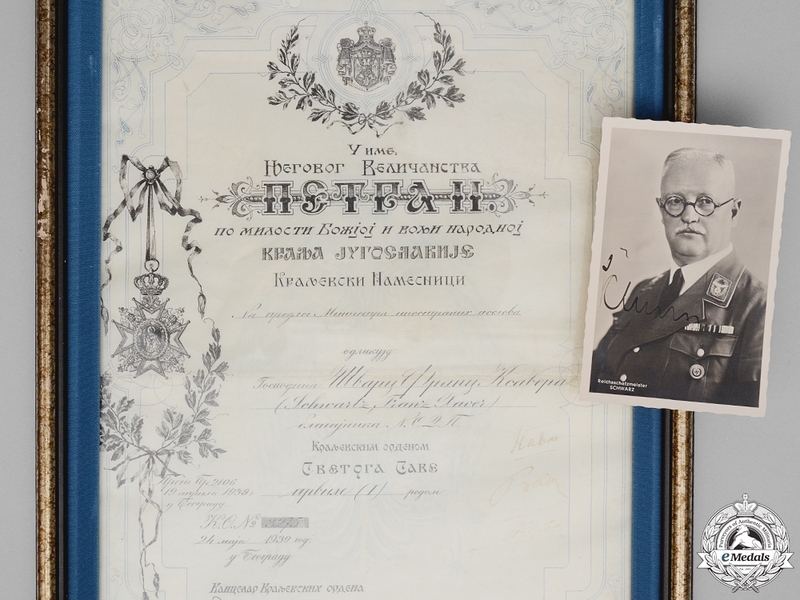 This St. Sava award was most almost certainly bestowed upon Franz Xaver Schwarz during this official visit of Prince Paul to Berlin in June 1, 1939. Footnote:Franz Xaver Schwarz (27 November 1875 – 2 December 1947) was a German politician who served as Reichsschatzmeister (National Treasurer) of the Nazi Party (NSDAP) during most of the Party's existence. Schwarz was born in Günzburg, the seventh of eight children born to a master baker and his wife. He was educated to a high school level at the Günzburger vocational training school. 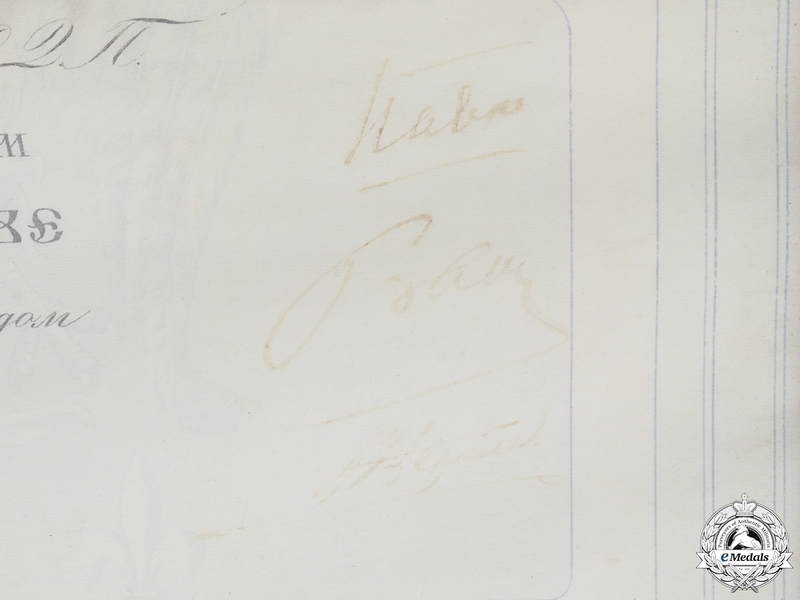 Schwarz married Berta Breher on 26 August 1899. He was involved in the military and city government of Munich between 1900-1925. He began service by volunteering at the Günzburger District Court, and then worked as a notary. Schwarz served in World War I as a second lieutenant in the infantry. 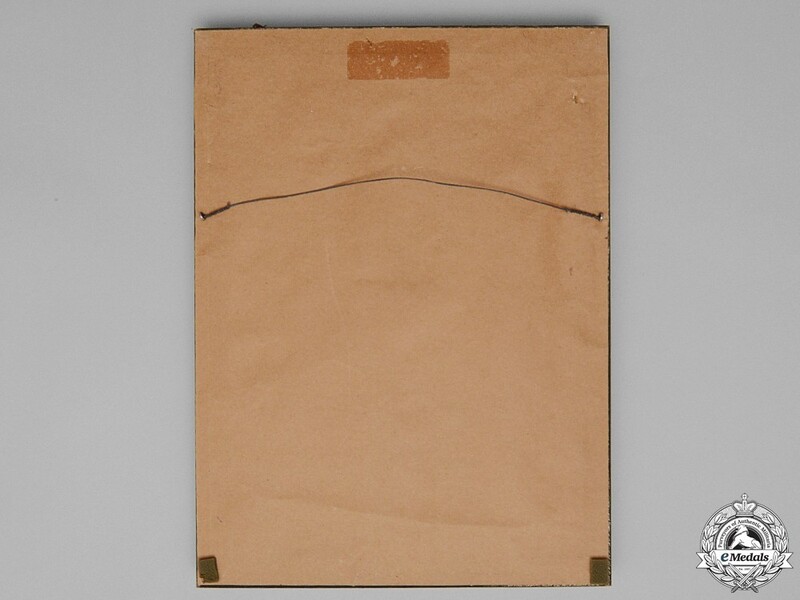 Due to gastric troubles which afflicted him for his entire life (he was considered 30 percent disabled in that war), he was spared field duty beginning in 1916. Schwarz joined the Nazi Party in 1922. Schwarz participated in the failed Beer Hall Putsch of November 1923. With the re-establishment of the Nazi Party in Germany on 27 February 1925, Schwarz became party member number six. He left his job as an accountant at the Munich City Hall to become the full-time treasurer of the Nazi Party on 21 March 1925. He rebuilt the financial and administrative functions of the party. It was Schwarz who raised the money for the publication of Hitler's book, Mein Kampf. In April–May 1930 Schwarz negotiated the purchase of the party headquarters, the Brown House at 45 Brienner Straße in Munich. Schwarz was elected to the Reichstag in 1933, representing the Franconia electoral district and continued thus to the end of World War II. He was also named a Reichsleiter (Reich Leader), which was the second highest political rank of the Nazi Party. On 23 March 1934, Hitler gave Schwarz full authority for the financial affairs of the party. Hitler attended Schwarz's 60th birthday celebration on 27 November 1935. Hitler's will, dated 2 May 1938 (which left his entire fortune to the party) included the provision that it be opened in Schwarz's presence. Besides the party treasury (largely based on membership dues), Schwarz was responsible for the central assignment of NSDAP unique membership numbers. When members died or stopped paying dues, the old numbers were not freed up for new members. If old members picked up their dues later a new party number would be assigned. Ten million membership numbers had been assigned by 1945, with about 2.4 million active members. Schwarz's able administration of party funds ensured a cash balance of one billion reichmarks by the end of the war. Schwarz was regarded as an able administrator who generally kept out of party politics. For instance he is only mentioned twice in Joseph Goebbels's diaries. The first time (9 April 1926), Goebbels wrote dismissingly of him, but by November 1944, the Propaganda Minister's attitude had changed; he now regarded Schwarz as one of the most reliable and respectable party men. In June 1933, Schwarz joined the SS, and his SS number was 38,500. On 1 July 1933 he was appointed SS-Obergruppenführer. 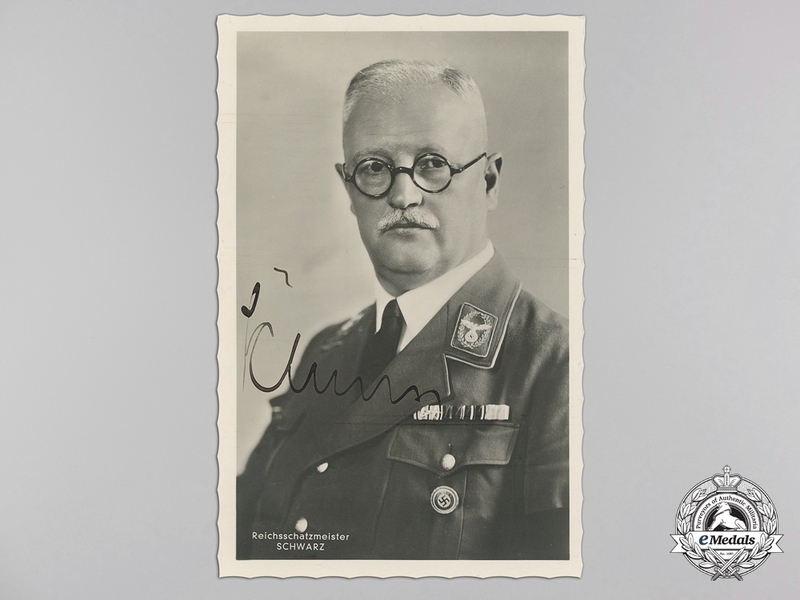 Later, he was one of only four people to have held the rank of SS-Oberst-Gruppenführer, and, of the four, the only one to hold the rank as an honorary title without equivalent Ordnungspolizei or Waffen-SS rank. That high rank was granted him on Hitler's birthday, 20 April 1942. On 5 June 1944, Schwarz was granted a high military award, the War Merit Cross, 1st class with Swords (Kriegsverdienstkreuz 1. Klasse mit Schwertern) by Hitler for his work during the Munich air raids of24–25 April of that year. Further, Schwarz led a Volkssturm battalion in Grünwald at the end of the war. He was arrested by the Americans. Schwarz died in an Allied internment camp near Regensburg on 2 December 1947, due to recurring gastric troubles. He was 72. In September 1948, Schwarz was posthumously classified by the Munich de-Nazification court as a "major offender". Schwarz remains an enigmatic member within Hitler's inner circle, due to the fact of his having died without being properly interrogated. His diaries and other papers were also burned in the Munich Brown House in April 1945. Owing to this, there are considerable gaps in the historical record specifically on how the Nazi Party was financed and where its money went after the war.